This expert skylight buying guide discusses types of skylights, planning a skylight’s location, glazing options, energy efficiency, and more. Skylights above this kitchen and family room flood the open-plan living spaces with natural light. A new skylight can completely change the character of a room, adding brightness, a sense of spaciousness, and style. It can scatter sunbeams throughout a dreary kitchen, brighten a dark bathroom, capture a view from an attic room, or provide a starry-skied bedtime panorama. 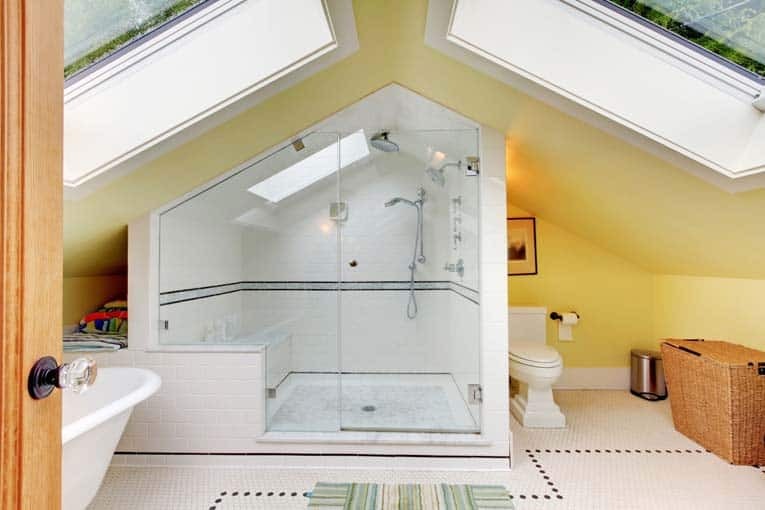 Second floor bathroom is bright and airy, thanks to two skylights. A skylight can save you money, too. In addition to reducing the need to use electric lights, it can deliver warmth in the winter and cooling in the summer, minimizing the need for fuel-based heating and air conditioning. 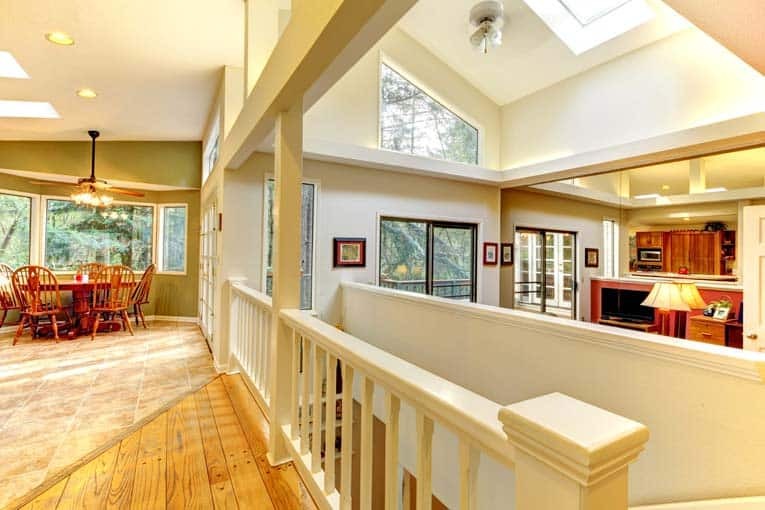 On winter days, the sun’s radiant energy can shine through a south- or west-facing skylight to warm interior surfaces. And in the summer, a ventilating skylight can promote air circulation by releasing the warm air that naturally rises. 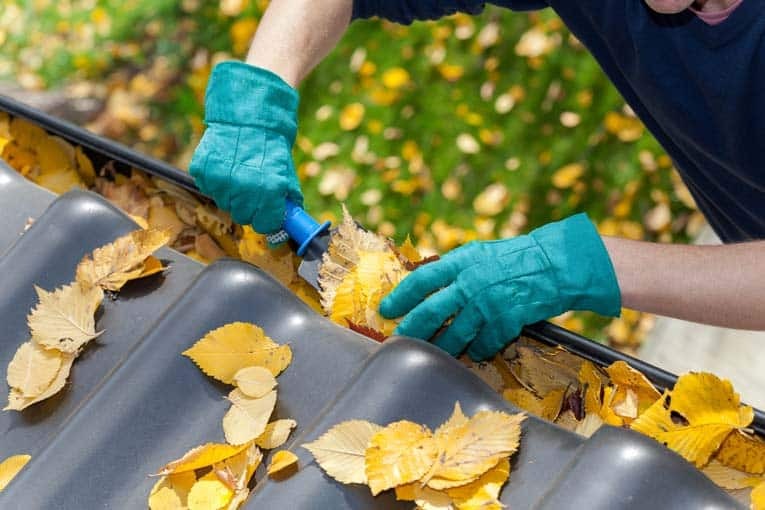 The trick in making these savings a reality—and in keeping your home comfortable—is to choose the right materials and features, and place the skylight where it can do the best job. Skylights may be plastic or glass, fixed or operable, and made in any number of sizes and styles. They can have insulated glazing, UV-blocking capabilities, louvers, shades, and more. Knowing the right materials, the proper size, and the appropriate features to meet your needs is critically important. 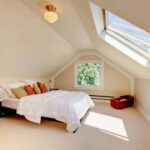 Keep in mind one important fact: A skylight will only work in a room that is either directly below the roof or is below an unfinished attic space. If you want to install a skylight in a room that has an attic above, you’ll need to build a light shaft through the attic. Skylight shafts channel light from the rooftop through the attic, and into the room below. The shape of a light shaft controls the spread of the natural light beam. A shaft that’s flared on all four sides spreads light over the widest area. A perpendicular shaft with vertical sides focuses the light straight below. A shaft flared on only one or two sides sends more light in the direction of the flared sides. 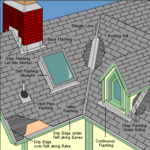 For more about building a skylight shaft, see How to Install a Skylight. When planning a skylight installation, be sure to take into consideration the sun’s path. Skylights on the south- or west-facing portion of the roof will collect direct sun—skylights facing north or east may not get any direct sunlight. A skylight that receives direct sun can become an intense heat trap in the summer unless it includes shades, blinds, or some form of controlling sunlight (see Skylight Blinds & Shades). 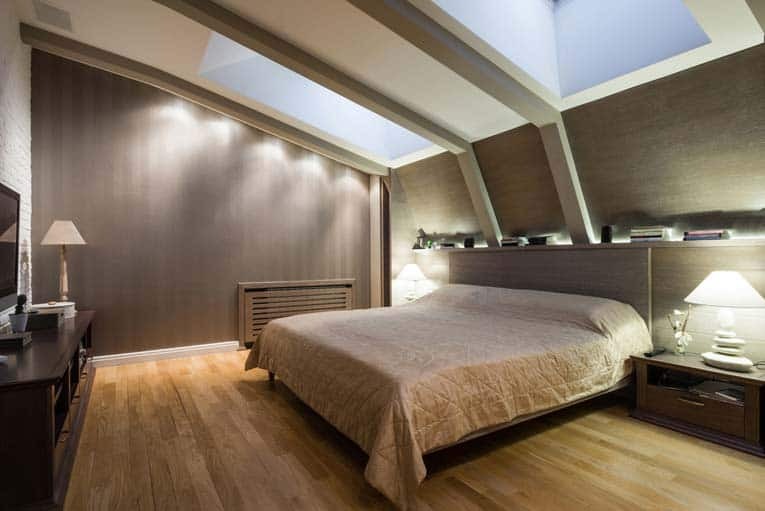 Dual skylights in this master bedroom offer nighttime views of the stars. This kind of placement calls for shades or blinds unless you want to wake up with the sun! Similarly, a skylight placed in a bedroom can offer a nighttime view of the stars but, if it doesn’t have some form of daylight blocking shade, it can also offer a rude awakening at daybreak. Of course, any skylight that is intended to provide a view must be kept clean, so ease of maintenance becomes a factor in choice of location and the type of skylight. Sizing and placing a roof window in an attic room so that it captures a view calls for careful planning. The roof’s slope will affect proper placement. A low-sloping roof will require a taller window than a steeper roof for the same amount of view. Manufacturers of roof windows have charts that list recommendations based on the slope of the roof. Skylights can also work outdoors. Here they allow light—but not rain—into a wide covered veranda. Be sure any skylight you intend to install will meet local codes for load, wind resistance, and related factors. Building permits are required for installation in most regions. Skylights are glazed with several variations of glass and plastic in single, double, and even triple glazing. Several manufacturers make both glass and plastic. Weight is a big factor. A 4-by-4-foot plastic-dome skylight weighs about 65 pounds compared to a glass skylight of the same size at about 120 pounds. Most quality plastic skylights are double-glazed with two plastic panes separated by an air space. 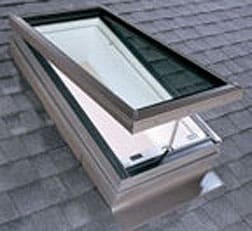 As a rule, plastic skylights, generally acrylic or polycarbonate, come molded in flat, bubble, round, pyramid, ridge-shaped, dormer, and barrel-shaped profiles, and they’re available only in standard sizes. Plastic glazing is chosen where light weight, durability, and economy are important considerations. Mounted at the hottest part of a house—the ceiling—an operable skylight offers excellent ventilation. Glass is generally preferred for skylights because it has a more elegant appearance than plastic, offers a clear view, doesn’t scratch, and can be ordered in a wide variety of sizes and types. Of course, the more features you want, the more expensive the glazing will be. Tempered, double-insulated glass. This is the minimum standard for most quality products: tempered for safety and two layers of glass with an air space in-between for energy efficiency. Tempered, double-insulated glass with low-e (low-emissivity) coatings. With this glass, the outer pane is tempered, and the inner pane has an invisible low-e coating that helps hold heat in during the winter, reduces heat gain in the summer, and cuts ultraviolet (UV) rays, which bleach fabrics and damage furniture and floors. Tempered, double-insulated glass with low-e coatings and an argon gas filling between panes. This glass is the same as the one above but has even greater insulating value. Some companies, such as Marvin and Pella, offer low-e, argon-filled glass as standard; other manufacturers sell this as an option. Tempered, low-e, argon-filled glass with a bronze tint. This features the same qualities as the above two but is designed to cut back on solar heat gain. Tempered-over-laminated, low-e, argon-filled glass, with or without a bronze tint. Designed to eliminate the danger of interior glass breakage in areas that require laminated glass, this type blocks nearly all UV rays. It’s a sensible glazing for regions where the sun’s heat buildup is a problem, such as on south- and west-facing roofs in hot climates. The following chart compares values of Velux’s glazing options. The best glazing to choose depends on the performance needed for a particular application. U-value, which depends not only on the glazing but also on the frame and all related parts, measures the rate of heat flow (from either side) through a skylight. This measurement does not include solar heat gain. 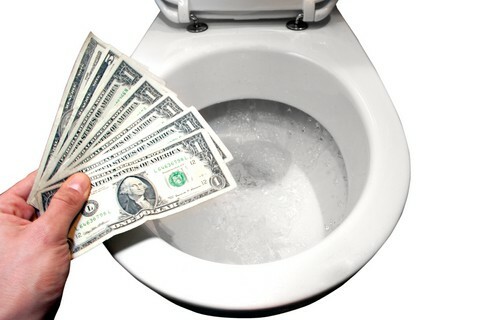 The lower the U-value, the better the product resists heat flow. R-value measures a material’s insulation value—the resistance a material has to heat flow. In reference to skylights, this value is usually placed on the glazing. The higher the R-value, the better it insulates. 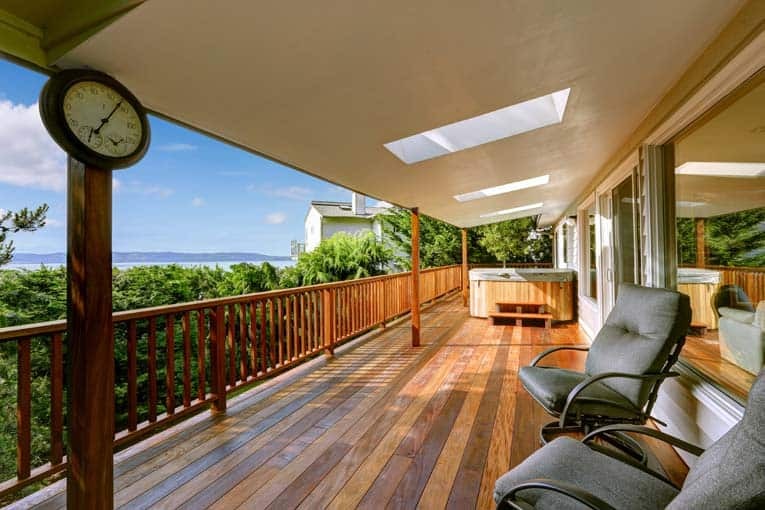 Skylights with the best R-values have low-e insulating glass with argon gas between the panes— these yield about twice the insulating value of standard dual-glazed panes. Shading coefficient measures solar heat gain through glass. This coefficient compares a particular glazing with a single pane of 1/8-inch-thick, double-strength glass. A low shading coefficient means low solar heat gain. UV blockage is a value approximated by glazing manufacturers, expressed as a percentage of ultraviolet rays blocked by the glazing. Visible light transmittance (VLT) is a measurement used by some manufacturers of the percentage of visible light a skylight transmits. Where homeowners want plenty of natural light, they opt for high VLT values. Tinted glazing, which blocks glare by letting in less light, has low VLT ratings.